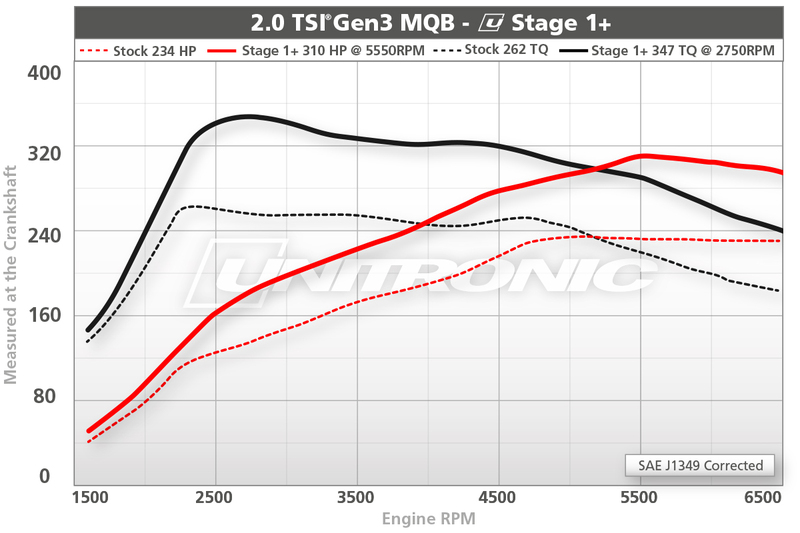 Unitronic is pleased to announce the official worldwide release of its Performance Software for the 3rd generation of Volkswagen's 210- and 220-horsepower 2.0 TSI® (EA888) engine. Unitronic has precisely re-calibrated the SIMOS 18.1 engine control unit (ECU) to deliver maximum performance while ensuring complete OEM-like reliability and driveability from Volkswagen's latest generation of the turbocharged four cylinder 2.0-liter TSI engine found in the MQB chassis. Unitronic's Performance Software is programmable directly through the OBD-2 port and within minutes you'll be enjoying a total night-and-day driving experience. Unitronic's Stage 1 and Stage 1+ Performance Software are both designed for otherwise complete stock vehicles, requiring no supporting hardware modifications and provides a great entry-level upgrade. 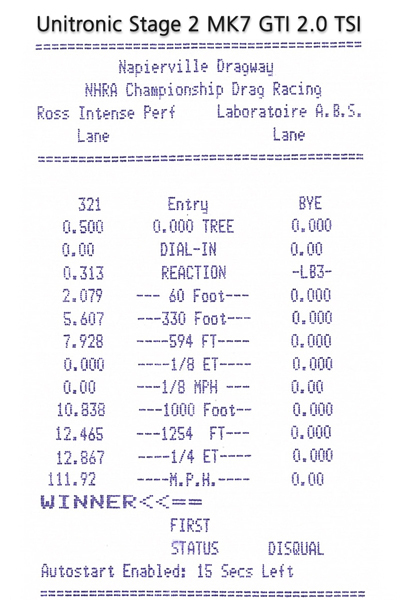 Stage 1 is optimized for 91 OCT/95 RON fuel, producing 297 HP/346 lb-ft TQ. For Clients with access to 93 OCT/98 RON fuel, Stage 1+ takes advantage of higher grade fuel, producing an increase in output to 310 HP/347 lb-ft TQ; a remarkable +76 HP and +85 lb-ft TQ over Unitronic's recorded stock figures. Taking it to the next level, Unitronic sets itself apart from the competition with its Stage 2 Performance Software, requiring a 3” downpipe, which alleviates exhaust restrictions created by the stock catalytic converter allowing for optimal dissipation of exhaust backpressure and maximum flow. 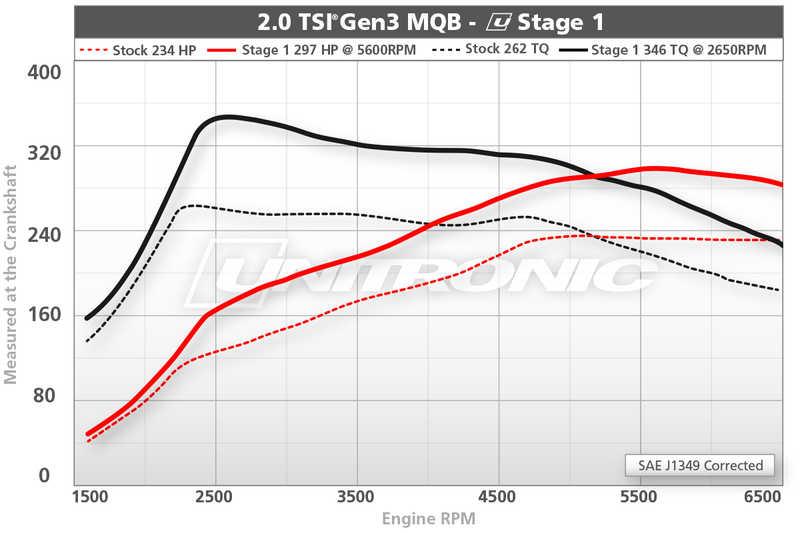 Unitronic's Stage 2 Performance Software boasts an increase of 103 HP and 108 lb-ft of TQ over the stock power as recorded by Unitronic, with an output of 337 HP and 370 lb-ft of TQ. Through Unitronic's extensive track testing, it quickly became apparent that getting traction would prove challenging in early stages of beta testing software calibrations. For Front-Wheel Drive (FWD) platforms with an engine that produces a considerable amount of torque peaking at 2750 RPM, Unitronic implemented advanced torque management by gear, designed to limit wheel spin to ensure maximum forward acceleration is achieved. Unitronic's advanced torque management aids in optimal 0-60 mph, ¼ mile, and other various acceleration scenarios when traction is important. 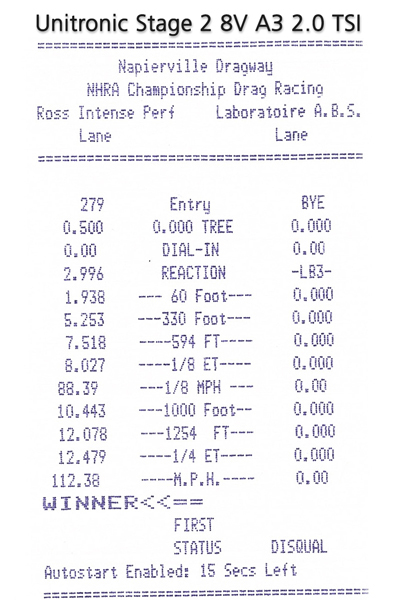 Unitronic's MK7 GTI accomplished a 12.867 E.T. @ 112 mph in the ¼ mile, equipped with Unitronic Stage 2 Performance Software, Unitronic 3” Turbo-Back Exhaust System and Unitronic Carbon Fiber Intake System, using 17” Enkei RPF1 wheels and Hoosier 245/45/17 D.O.T. Drag Radials. 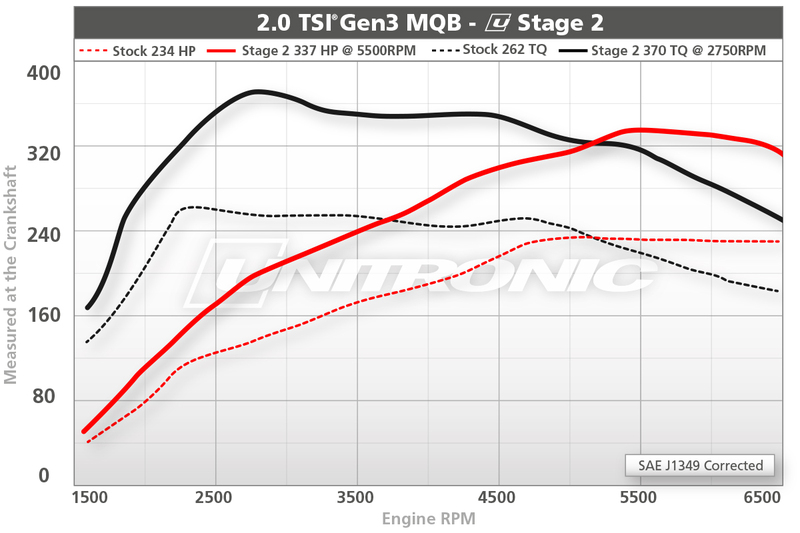 Unitronic's 8V Audi A3 2.0 TSI accomplished a 12.479 E.T. @ 112 mph in the ¼ mile, equipped with Unitronic Stage 2 Performance Software, Unitronic 3” Turbo-Back Exhaust System and Unitronic Carbon Fiber Intake System, using 19” BBS CH-R wheels and Michelin Pilot Super Sport 235/35/19 Street tires. For more information, be sure to contact your local Authorized Unitronic Dealer to get yours now!